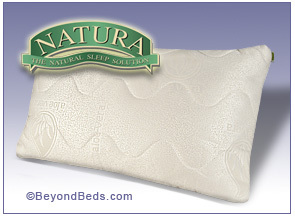 The Aloe Dream Mate pillow features a long-lasting granulated Talalay latex fill that has a down-like feel and adjusts to the unique contour of your head and neck. Naturally breathable and hypoallergenic, the anti-microbial properties of Talalay latex inhibit the presence of allergens such as mold, mildew and dust mites. Aloe Dream Mate Pillows have a non removable soft cotton blend cover, enriched with Aloe Vera and an inner layer of NaturaWool. Aloe Vera Provides Better Energy Balance. Scientific research has clearly demonstrated the beneficial action of Aloe Vera on the skin. The cotton fabric cover is enriched with Aloe Vera " Micro molecules". 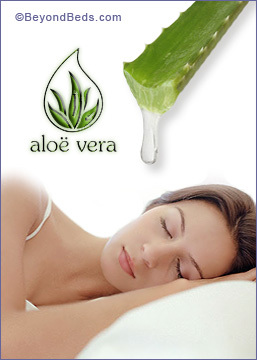 The Aloe Vera enriched pillow cover is very pleasant to sleep on, it is also very effective at the energy level, resulting in " better energy balance. Wool Responds to Temperature and Moisture. The NaturaWool lining is unique in the way it responds to temperature and moisture. It adjusts throughout the night to accommodate fluctuating body temperature, resulting in better sleep. The Aloe Dream Mate Pillow is a dream come true! Standard: 26" x 18" x 6"
Queen: 29" x 18" x 6"
King: 35" x 18" x 6"
5-Year Limited Warranty. Made in Canada. Note : Please allow 7 to 10 days for delivery.